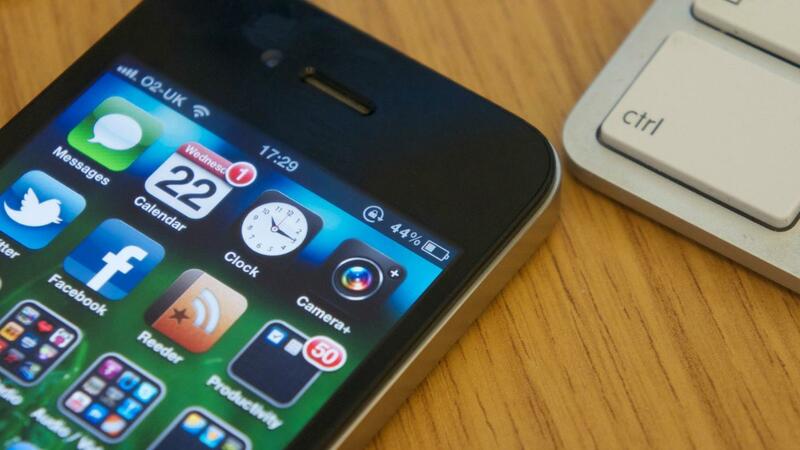 The iPhone 4 is quite an old phone now, but lots of people still own and even use them. The latest, and the only signed, version of iOS for the iPhone 4 is iOS 7.1.2. This is quite an old operating system, but can still sometimes lag behind on the iPhone 4. Lots of people, including myself, would rather have iOS 6 running on their iPhone 4. This tutorial will show you how to do just that, without the need of SHSH blobs. This will restore your device to iOS 6.1.3. This with ONLY work with the iPhone 4. No other devices are compatible. This require a Windows PC. Any data currently on the device will be erased, so make sure to back it up before attempting this. Once downgraded, you will need to plug your device in and follow step 10 every time you reboot it. Only do this with spare devices that you don’t use all the time. Download and install the latest version of 3uTools on your Windows PC from here. Once installed, open the 3uTools application. Make sure your iPhone 4 is plugged into your computer using the 30-pin USB cable. In the 3uTools application, click on the Flash & JB tab at the top of the window, followed by the Firmwares button under it to the right. 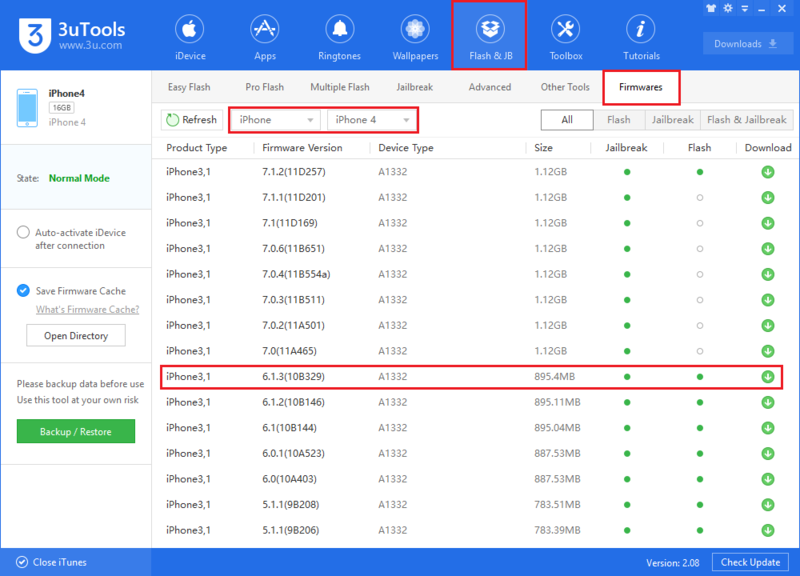 Select iPhone and iPhone 4 in the two drop down boxes in the top left area. A list of iOS versions show now appear for the iPhone 4. Download iOS 6.1.3 by clicking the green download icon to the right, making sure to get the correct one for your devices product version (e.g. iPhone3,1). Once the download has completed, click on the Pro Flash tab at the top of the app (under Flash & JB). On the left hand side, click the Import Firmware button. Browse for and select the iOS 6.1.3 IPSW file you just downloaded. Now you need to put the iPhone into DFU mode. To do this, hold down the power button and the home button together for 10 seconds. After 10 second, let go of the power button but keep holding the home button. After a few second, 3uTools should detect the iPhone in DFU mode. iTunes may also pop up saying the iPhone is in recovery mode. If it does, just close it. Once the firmware version is selected and the iPhone is in DFU mode, click the Flash button on the right. 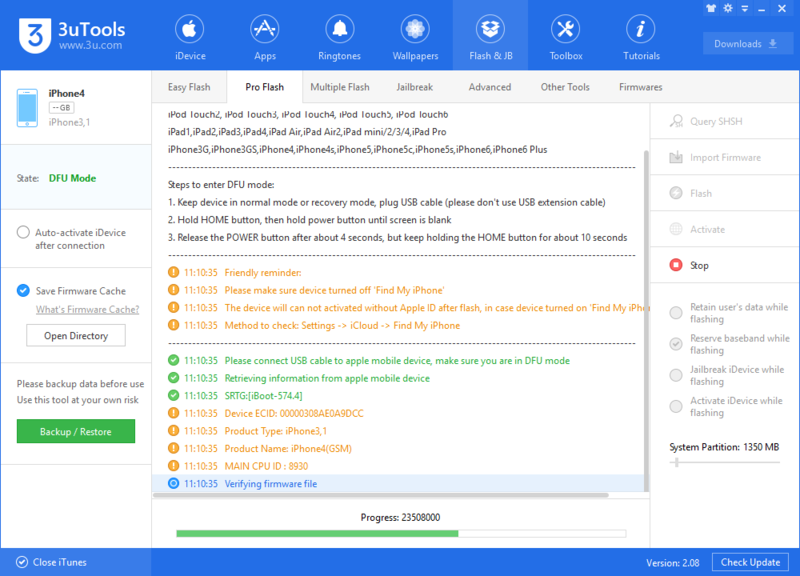 3uTools should now begin flashing iOS 6.1.3 onto the iPhone 4. The tool will check for SHSH blobs 3 times before asking if you want to force the install without SHSH blobs. When you are asked if you would like to force the install, click Yes. The install should now proceed. Once the install has finished, you won’t be able to boot the device. 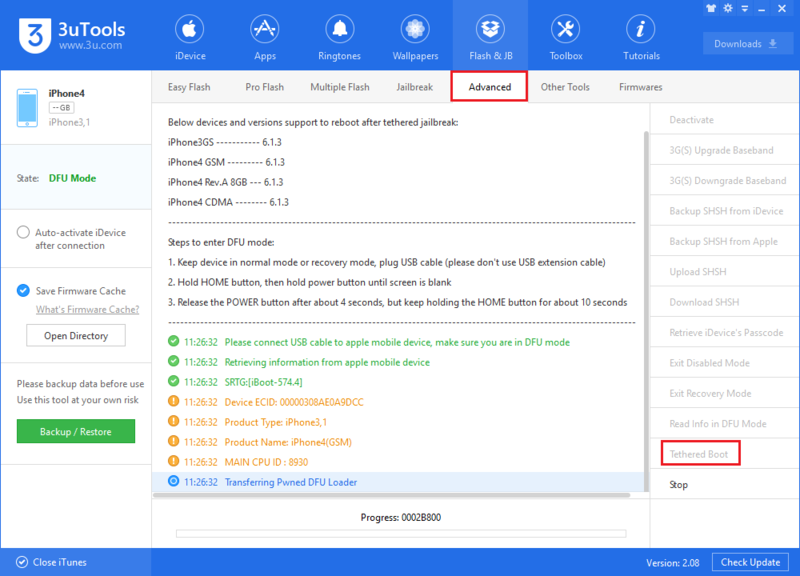 To boot it, you will first need to put it into DFU mode again using the same method as step 6 (if it is already in DFU mode then you don’t need to do it again), then jailbreak it using a tethered jailbreak. 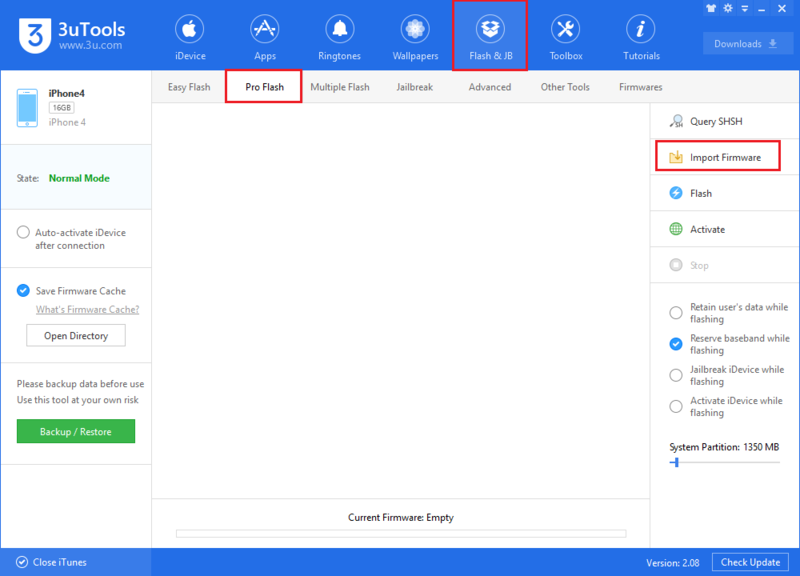 To do this, click on the Jailbreak tab under Flash & JB. In here, click the iOS 4.x / 5.x Jailbreak button on the right hand side. The device should now begin to be jailbroken. The device will show lots of code on the screen and when done, the screen should go black again. To boot the device, you need to do a tethered boot. To do this, make sure the device is in DFU mode, and click the Advanced tab under Flash & JB. Then click the Tethered Boot button on the right hand side. The device should now begin to boot. You will need to do this every time you reboot the device. That’s it! Your iPhone 4 should now be running iOS 6.1.3! You need to open Cydia and go to search. Type in INSOMNIA and install that plugin. Once it’s installed it hit home and open the phone settings, scroll all the way to the bottom and tap on insomnia. Enable it. There you go. No more black screen hang ups, you have to do tethered reboots and startups still. HELP!!! MY IPHONE WON’T TURN THE SCREEN ON!!!! But it can still charge and works. The thing is that the screen stopped working. Where can i download the plugin???????? I already tried the one that’s called “SAM” but dosen’t work. Thanks for the downgrade process , but every time IPHONE starts and after locking the iphone , screen goes black , can u please tell me which plugin to download and from where. Can it be jailbroken if not activateted? and if it could be possible to make an untethered jailbreak with 3uTools please tell me how to do so and if it’s still possible to use P0sixspwn for untethered jailbreak instead. do you also know how to use custom boot logos from cydia ‘Cause I’ve tried to do so but when I try to install “animate” and its fixer, it won’t install from cydia. Which version of iTunes you used during process? I’ve tried to downgrade iphone 4 from ios 7.1.2 TO IOS6.1.3 using 3uTools without SHSH but am stuck at jailbreaking and It shows me (Apple mobile device will connect to DFU mode automatically) and then it says (Operation time out click YES to view details click NO to exit) but its already in DFU mode so I’m stuck in DFU mode any ideas ? I really need your help !!! 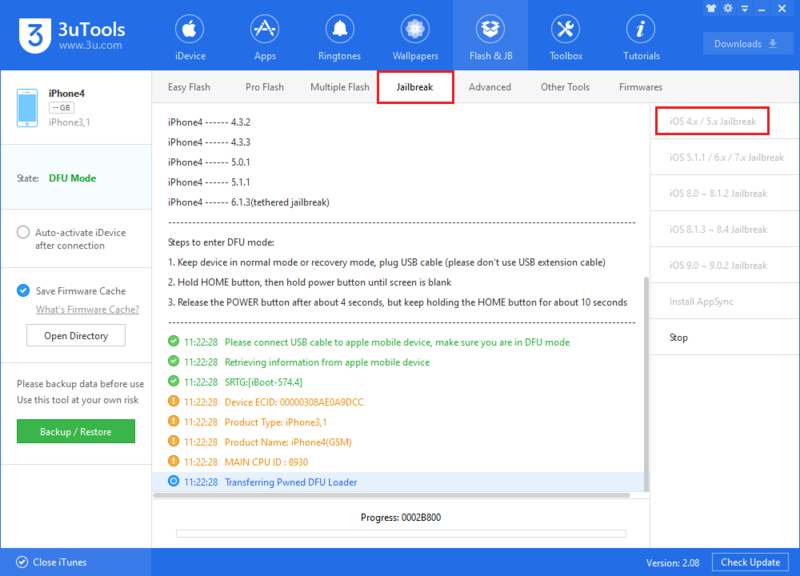 I was facing the same problem, managed to solved simply by selecting “Jailbreak iDevice while Flashing” and flashing 6.1.3 normally.